On Thursday I attended a Professional Development session that I had been keenly anticipating for a number of months. 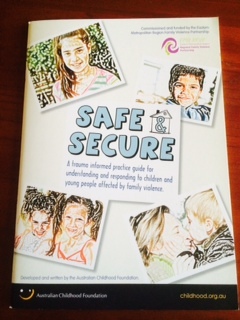 The session was run by the Australian Childhood Foundation (@auschildhood) and was called ‘Safe and Secure,’ with the content relating to supporting young people who have experienced family violence related trauma. I’ve been interested in the field of domestic violence for a number of years now, particularly after attending a session run by the Western Adelaide Domestic Violence Service about 5 years ago where I learnt about the complexities that victims of domestic violence face. I registered to attend this course because I was working with a number of children whose mums were experiencing DV at the time. I didn’t learn about the violence these children were exposed to from the children first hand; I’d learn about it when I had meetings with their mothers to discuss the unpredictable, bizarre, volatile, sometimes unsafe and occasionally dangerous and destructive behaviour that we were witnessing at school. It was when these disclosures were made that the behaviour all began to make sense and with my main concern (as always) being for the students, it was from there that I developed a keen interest in the effects of family violence related trauma on the children with whom I was working. I’ve done a lot of training with the Australian Childhood Foundation since around 2008. This was when I first learnt about Strategies for Managing Abuse Related Trauma (SMART) which turned my way of thinking and working with young people who experienced challenging behaviours on its head. In the initial years of the program’s release SMART was considered a model of best practice when working with students who had a history of abuse as we traditionally know it (including mental, physical, emotional and sexual abuse and neglect). In more recent years the SMART framework has included family violence under the umbrella of abuse related trauma because of the damaging effect it has on the brain development of children who are exposed to it. I was particularly pleased to hear this inclusion because in my experience in schools, family violence was the top cause of high level challenging behaviours that I worked with most prevalently (in fact, significantly way more than any of the traditional abuse categories combined). You may not be aware of any situations in which children at your site are affected by family violence or you might not understand the effects of the trauma sustained on young people. For whatever reason (I think it’s largely as a result of our society’s attitude domestic violence which is slowly but surely changing) teachers have very little knowledge about it, let alone how to support young children who are caught in the middle of complex and violent home situations. If you’re interested in learning more about this topic, I suggest you check out the Australian Childhood Foundation website, particularly the SMART online training section which gives a great insight into how the experience of abuse related trauma (including experiences of family violence) impact brain development and behaviour. ← How Becoming a Parent Made Me a Worse Teacher.